Colectivos are the buses that run up and down all of Buenos Aires. There are well over 100 different bus routes, so this is a complicated system. If you plan on using buses, you should purchase a “GuiaT,” which is a guide of the different routes. In this guide, you should be aware that the specific stops will not be listed, but rather a chunk of the city will be grouped into a square portion. For example, you are leaving from a street in a five block by five block area in Palermo, which is displayed on square A5 on page 27. You are headed to a street in San Telmo in a five block by five block area which is displayed in the GuiaT on square C3 on page 19. Opposite square A5 on page 27, there will be the numbers of all bus lines that run in that five by five block square. The same will be true opposite square C3 on page 19. If two bus lines correspond (and they usually will), you can just hop onto that bus from your starting point and hop out once you enter into the five by five block square where your destination is located. Confused? I was too at first, but as long as you have patience and can read a map, this process gets easier over time. When you step on a bus, you must indicate to the driver how much you are paying. Most buses cost either .90 centavos or one peso depending on the length of your trip. Unless you will only be traveling a couple of blocks, you should indicate that you will be paying .90 centavos. Once you have told the driver your fare, you must pay using one of the automatic ticket machines directly behind the driver. These machines can only be paid in change (they do not require exact change) so make sure that you have coins before you board the bus. The subway (subte) has five different lines and reaches many parts of the city within a few miles of the center. Buses cover a MUCH larger portion of the city than the subway does, but the subway system is far less complicated. However, like buses, during rush hour the subway can be extremely tightly packed and deathly hot. Rides can be purchased in all stations for .90 centavos per trip. It should be noted that most stations close shortly after 10pm, which can be a real bummer as the subway is a great way to get around town. Taxis also travel all over the city. There are two types of taxis; radio taxis and non-radioed taxis. The recommended choice is radio-taxis because they are regarded by locals as a safer option. (Apparently shortly after the economic collapse five years ago, there was a problem with robbery in taxis). Radio taxis will be clearly labeled with large letters on the doors. Like in most large cities in the United States, you just need to put out your hand and flag one down. Unlike some other countries in South America (like Chile), taxis are very inexpensive. A 20 minute cab ride from one end of the city to the other will rarely cost you more than $15 or $20 pesos. A tip of 10% is greatly appreciated by drivers, and most people simply round up their fare to the nearest peso. Also, you should be aware that taxis are often impossible to track down when it is raining or on holidays. Do not attempt to pay a taxi driver with a large bill, he or she will not have change, which bring you another set of problems. When deciding which mode of transportation to choose from, you need to pick which one suits your comfort zone and means. If money is not an issue and you do not mind having to spend the equivalent of US$2-$6 to navigate the city quickly, taxis are the way to go. 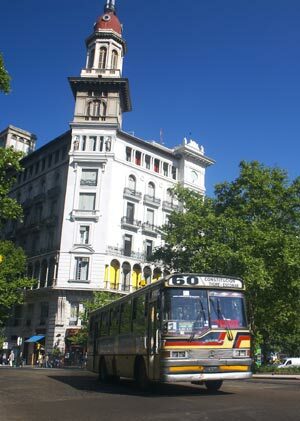 But if you are like me and want to take a more frugal approach (and do not mind sometimes being squeezed in between locals), learning which buses run past your apartment or hotel can save you a lot of money. But if you would like the cheapest option and do not mind a little bit of a walk from time to time, you can stick to subways. I think the advice to tip and “keep the change” is wrong, and perhaps based on American standards. I’ve been told by all of our local (native Argentine) friends here that the Taxi drivers consider themselves professionals, and thus it is custom to never give tip unless they are truly outstanding — in contrast to cab drivers in New York who EXPECT a tip. In fact, the drivers here will always give back exact change, and have seemed offended a few of the times I offered to let them keep the change, insisting on giving the change back. This page rendered in 0.015 seconds.